***Pic 1. Shows 2019 Model w/ New Seat Design. ***In Stock. Usually Ships in 1 Business Day. FREE Shipping. No Hidden Handling Fees. 1 Year Warranty Including Engine. * FREE Liftgate Delivery. 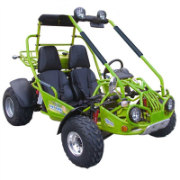 The TrailMaster 150 XRS go kart is the best built 150 cc buggy on the market. This offroad go-kart is designed for a wide range of riders from 10 years old to 90 years old. The TrailMaster 150XRS is roomy with a dash forward, open cockpit design. There's a lot of leg room for the big guys. The tilt steering wheel can be adjusted so that the youth rider can see over it. The driver's seat is also adjustable to accommodate a wide range of drivers. The seats in the TrailMaster 150cc are wide with side bolsters. Also, the 150 XRS comes standard with 5-point racecar style seatbelts. These features along with tall side rails and high top bars make for a comfortable and safe go-kart. The engine on the 150 XRS uses a Japanese carburetor of top quality and a stainless steel muffler with a spring mounted manifold pipe similar to those found on racing dirt bikes. The sprocket and chain are a heavy-duty #530 and very easy to adjust. The engine air intake on the 150 XRS is located behind the driver seat headrest, which enables much cleaner air pick up. Displacement: 150cc Brakes: Front & Rear Hydraulic Disc Weight: 485 lbs. At GoKartMasters.com we believe that the TrailMaster 150 XRS is on of the best buys and a great value in the industry. Two people can go offroading for less than $2500. That's unheard of in the ATV market. Plus, the 150 XRS is a whole lot safer than an ATV. For inexperienced drivers, the 150 XRS is much easier to learn to drive without having to learn body movement that is necessary to properly drive an ATV. This go-kart is made of real steel. It has value and not disposable like computers, video games, etc. The 150 XRS has excellent resale value which can be around half the purchase price even after 6-8 years of use for a kart in decent condition. The top speed of the TrailMaster 150 XRS is approximately 40 miles per hour. The go-kart has plenty of power, but it's not a crazy pop a wheelie when you hit the gas kind of power. However, the 150 XRS has enough power to spin the tires on loose dirt or gravel. There is adequate power for hill climbing. On an extremely long and steep hill, the kart may slow down some, but it does not like to give up. The 150 XRS is very reliable and has one of the most popular engines, GY6, in the world. There are tons of replacement and performance parts available for this GY6 engine. Designed to fit in the bed of a full-size pickup truck. The two most common issues that we see with go karts, ATVs, lawn mowers, boats, etc. include gasoline and batteries. These problems can affect all kinds of equipment from $100 lawn mowers to $10,000+ ATVs and side-by-side vehicles. However, these two issues can be prevented with a little knowledge and understanding. To find out how you can avoid these common problems, visit our Go Kart Masters Garage for more information. After a miserable experience with a different brand go kart from another seller, we are still amazed by the performance of this kart. It runs and it runs well! We've only experienced extremely minor issues, which were quickly and easily resolved by GoKartMasters. Hard to express how pleased we are with the ride (awesomely fun for the 14 yr olds and parents!) and the company. Without any hesitation, I would recommend the XRS 150 and would not buy from any company other than GKM. Wonderful Buggy my daughter loves it, runs great, faster then I thought it would be. plenty of power to haul her and myself anywhere we wanna go. Would definitely recommend this buggy .